Giving daily expression of gratitude is easy for me here in Nicaragua. For more than 20 years I had a photo of a house on the beach magneted to my fridge. The house looked like a cottage and the water was big but non descript. Now I can say that my house on the beach exists. It doesn’t look like the place or the water in the picture, however, here I am living in a house with the most beautiful ocean view in a country that is tranquillo, warm and beautiful. You notice I speak the word “warm”. Temperature average of 82 degrees suits me just fine. I am also grateful for my wonderful family and friends both in the US and here in NI. My circles of friends are supportive and encouraging for the nutty life that I have created and lead. This month was especially interesting and deserved a bundle of gratitude. 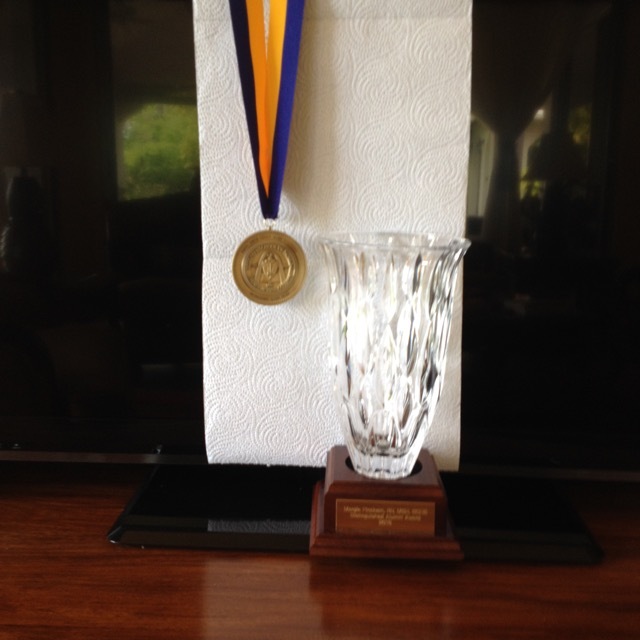 One of my Barnes School of Nursing friends, Carole Manners, nominated me for the new Barnes Jewish College Goldfarb School of Nursing 2015 Distinguished Alumni Award and I received it as the Barnes Graduate at the College Homecoming Event October 9th. Now, just in case you may be thinking that this is a big deal and it is, the Jewish School of Nursing Alumni, Olive (Ollie) Coe is 92 and graduated from Jewish in 1944. She is beautiful and fun. 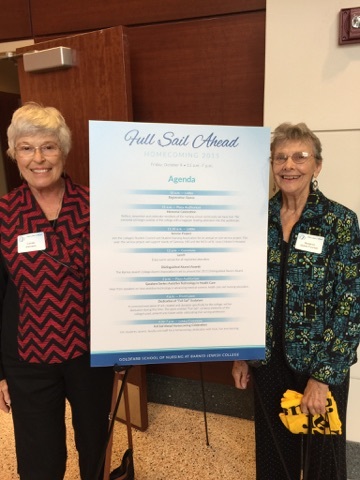 Carole Manners and I flew to St. Louis for the day long Event where Ollie and I were given our awards. We had a great time for two days enjoying the Barnes Jewish Foundation dinner on Thursday night and then the lectures, etc. on Friday. 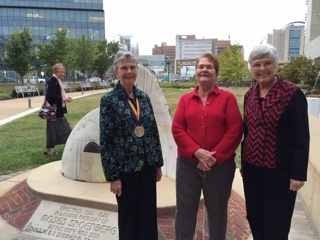 Thursday night was also the unveiling of a commissioned sculpture for the BJC Goldfarb School of Nursing. Carole and I were both highly impressed with the growth of the College since we attended the Homecoming Event in 2009. At that Event we walked with the second graduating class from the new Barnes Jewish College Goldfarb School which coincided with our 50th year anniversary as graduates of the Barnes School of Nursing in 1959. It is interesting to note how the school is organized program wise. Students without a bachelor’s degree in another area who are just beginning their nursing college experience are in a five year program. Students with a previous bachelor’s degree are in an “excellerated” program and graduate in two years. These students are then put into mentoring programs in the field of their nursing choice. I have to say that I was given the 2015 award mostly for the work I have done in Nicaragua, although the Lord knows my work is eclectic, diverse and continuous. I am grooming my maid right now to enter a nursing program in Rivas from a private college. Melvin Lopez, the young man I sent through nursing school graduated with his diploma from a public university in Rivas. Melvin, incidentally, will continue his studies next month to receive his nursing licensure. Before I flew to St. Louis, I flew from Managua to Chicago and then drove to Indiana to see my cousins from the northern Indiana area where I was born. Out of 32 first cousins, there are only nine of us left. My three brothers and I are four of those nine. I had a great time being shown around the farmlands that I used to know. However, so much has changed with new superhighways and subdivisions, that without my wonderful tourguide cousins Dorothy and Clayton Hoevet, I would have been hopelessly lost. We had a ball though and didn’t eat dinner at home one night of the four nights I was there. We were “on the road again” as the song goes. 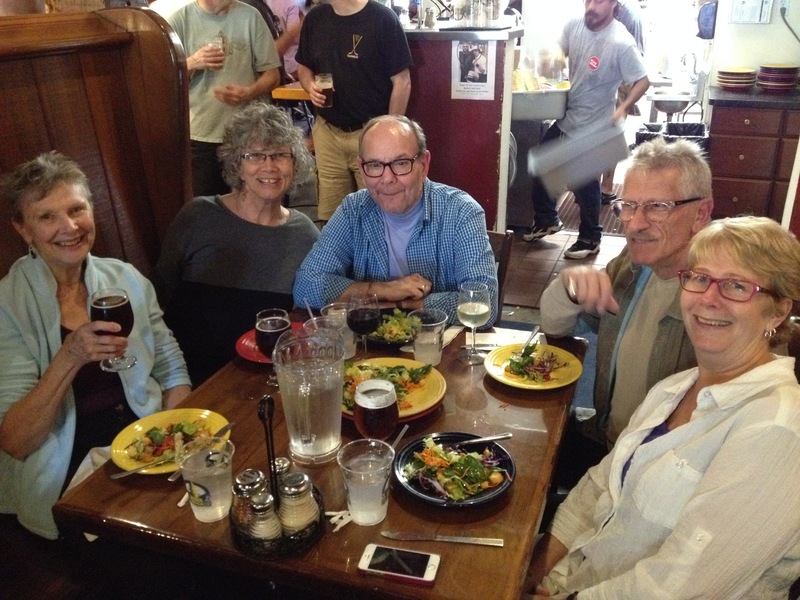 Five of the IN cousins all met for lunch one day, thanks to Don Kotrba for the treat. We laughed and stayed in the restaurant until their dinner clientele were beginning to arrive. So many fond memories for which I am grateful. My Nica family has grown in the past week. My friend and former landlord, Carmen Guzmán had a baby boy a week ago. Sebastian is beautiful and Carmen is amazing. She continued law school up until the week of the birth via an emergency c-section for baby stress. Now she is trying to see how she can take the final exam, one week after the birth. Carmen is also the mover and shaker of the Guzmán family. She opened her Spa where I used to park my car. And now the little Guzmán Pulpería that was next to the casita where I lived is tripled in size to a mini-store. I am so very proud of this family. They are wonderful role models in the Limón #2 community. Rain has finally begun so that the flora are turning green again. The weeds in the yard are growing “like weeds” and I can’t complain. As I look out over the hills to the ocean at least it is green again, another cause of gratitude. I am happy to report that the new Costa Esmeralda International Airport had its grand opening last week. Now for a healthy sum people can cut their driving time from Managua, NI or Liberia, Costa Rica by 1 1/2 hours to Rancho Santana. The paved road is inching its way toward us and the airport which is scheduled to have regular flights in November. I look forward to the day when the road finally gets out to the Limóns, although I am grateful for the amount of block road that is already completed. Yesterday and today I had the opportunity to watch them create that road as I was headed to Rivas to the attorney. The paver blocks look like a square jigsaw piece. After the concrete road edge is laid and initial string line is placed, the blocks are stood on their side edge in a row like you would line up Dominoes. Then they are laid down like puzzle pieces one after another. Line by line no cement. It helps to have a lot of workers who are now VERY familiar with this process. It is fascinating to watch, however. In between the two days that I made the trip past this paving area, I think they laid more than a football field length of road. They lay one way first diverting the traffic to the dirt on the other side and holding traffic for turns in use of the only part remaining. Today, we actually drove on a part of road that was being laid yesterday. Progress in NI for sure. Nothing major or urgent going on this past month in Nica for me. However, I have become a consultant to many locals as well as expats. In case anyone needs consulting information, I am currently a person for Business Plans, Land Sales, Wound Care, Health Triage, Area Guide, and Business Referral. You can see I am not sitting around eating sweets all day. The condo has renters for a few weeks in November and December. I am grateful for this gift. The condo is beautiful and comfortable. My maid works four days at the condo keeping it open, aired and clean. She works two days for me at the Wisley house up here on the hill where I am living. All is well. Life is good in Nicaragua. 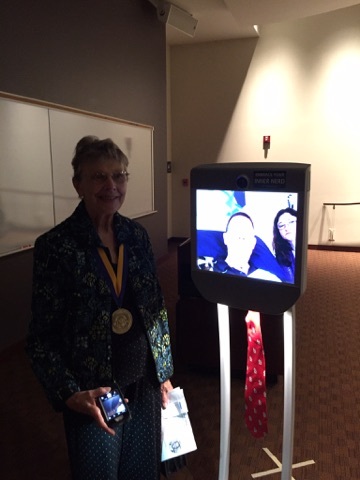 Guest lecturer at BJC Event via his robot. Henry Evans is a 50 yr. old man, totally paralyzed except for head movement. His wife speaks for him as he reads a letter board and blinks his eyes. He developed the system of robotic software whereby he virtually attends lectures, museums etc. throughout the world where a robot can be acquired. (The red dangling piece is his “tie”.) I couldn’t resist talking to him after the lecture and asking to be photographed with him. Carole Manners and I with Agenda for the Event. Me, Carol Luckey, and Carole Manners 1959 Grads. 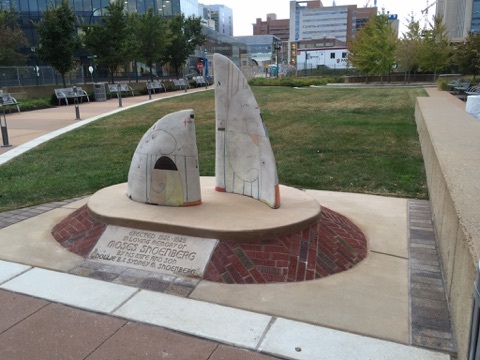 Full Sails Sculpture at BJC Goldfarb School of Nursing. Bricks at the base are from the torn down Barnes and Jewish Schools of Nursing dorms. I have only been gone to the US for four weeks and had an interesting and wonderful time with family and friends. However, as I was sitting on my condo patio this morning enjoying my latte and the different songs of the Ant Birds that visit me in the bouganvilla a few feet away, it was clear to me that I am a very grateful and happy here. 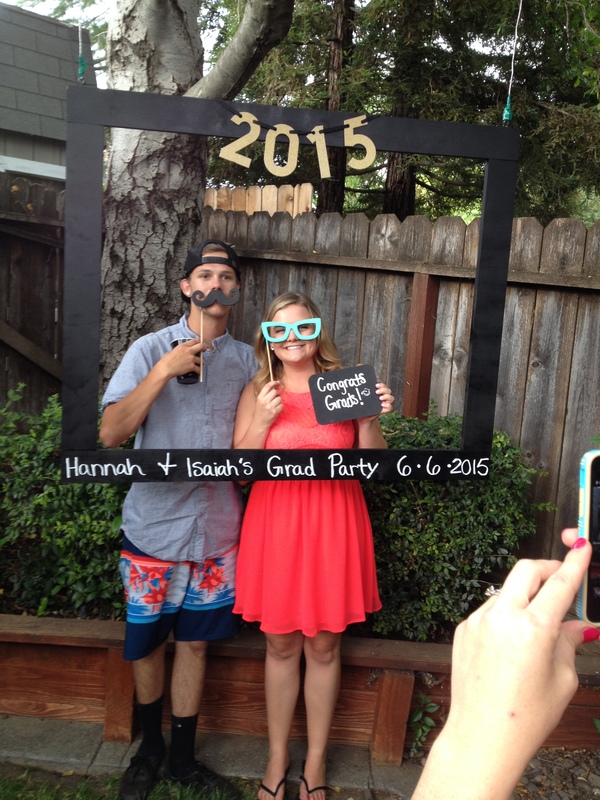 Two of my grandchildren graduated–Hannah Smith from Chico State and Isaiah Smith from Dixon High–which prompted my visit to the US. In between the two events, I was the chauffeur for Gloria and JW Williams–the Smith’s other grandmother and husband. They rented a Mazda 5 sedan and I drove us to Oregon where we stayed with a longtime nursing school friend and her spouse, Carole and Gary Manners. 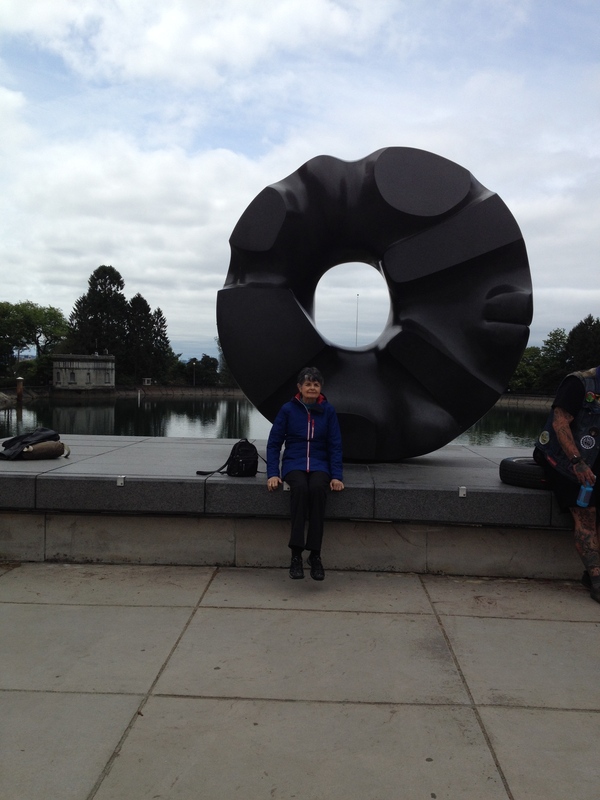 From OR we traveled north to Seattle where the Williams stayed with Gloria’s oldest son and I housesat for a friend who teaches in SEA, Joyce Murakami. Joyce and her partner, John Diles, were on their way to Hawaii where they were being married. Joyce and I took scuba classes and were buddies many years ago. I am Joyce’s nursing consultant for her elder family in Sacramento. The primary focus of the Seattle trip for me was to visit my stewardess days roommate, Ellie Parker, who moved to Seattle from San Francisco a long time ago. Ellie and I have always shared a love for art and music. We spent almost everyday enjoying or talking about art and music. People watching is another of our special common interests. We had fun people watching at the Ballard Locks in Seattle, near where I was staying. The five day visit in Seattle was great for all of us. Seattle’s weather could not have been better. Surprisingly, I didn’t freeze the whole time I was there. After leaving Seattle we drove down the WA and OR coast enjoying the beautiful forests, historical places on the Lewis and Clark trail, and of course the gorgeous blue ocean. We arrived back in Dixon, CA in time to help prepare the Smith house for the BIG graduation party the day of Isaiah’s graduation on June 6th. Hannah had planned almost everything for months ahead–it was six months at least of planning. There many of us worker bees staying in the area with assigned tasks–grandparents, aunts and uncles, cousins of Hannah and Isaiah. We, all 150+ of us, had fun eating, drinking, and enjoying each other. I got to see all of my immediate family and a lot of nieces, nephews, and friends that I hadn’t seen in years. The weather was perfect for such a noteworthy day. Miles driven on this trip by me = 2700. It is a good thing I like to drive. While I was in the US the wheels of my projects here in NI were still turning. The next Aproquen event plan is taking shape for three days in Granada in July. 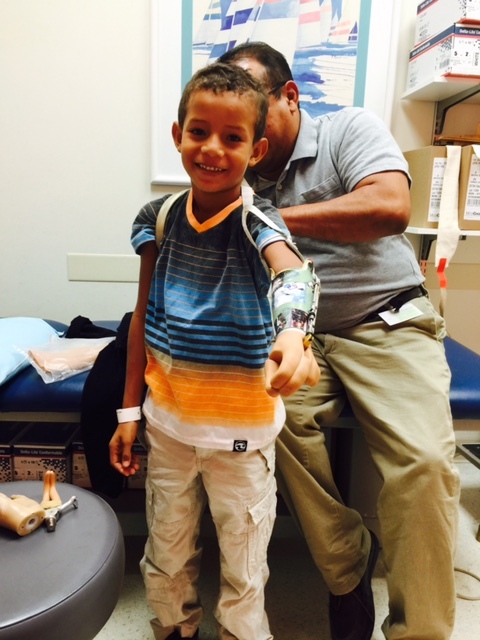 Hengel got to his doctor visit at Shriner’s Hospital in Philadelphia with help from my friends. I am including a photo of him on that day with the therapist. What an accomplishment for this little boy and his family. Nan Zinn, my business partner, took charge of delivering a custom bag order amid her crazy schedule working in her booth at the International Surfing Association (ISA) contest event that was held on our beach at Popoyo. The rains have started and are so welcome. The beautiful green fields are beginning to appear and trees that appeared to be dead have revived and are covering the bald spots on the hills. I will only be here in my condo for ten days before I move to my friend’s house on the hill while my condo is rented for five weeks. It is somewhat of a challenge to move while the condo is rented. If I were just going away, it would be easier, but I will be living in the area too. Therefore, I need to move survival items–printer, files, bag inventory, plus food and clothes. More about this experience in the next blog.